Jets’ forward Anthony Peluso bloodies the 36-million-dollar man, David Clarkson. In spite of increased competition at this year’s training camp, Anthony Peluso may have won himself a job with the Winnipeg Jets. Just 24 years of age, he’s a legitimate NHL heavyweight at 6’3, 235 lbs. He also acquitted himself quite well against the Oilers on Tuesday, scoring the game winning goal, and looking surprisingly comfortable handling the puck – especially for a guy who typically makes more use of his fists than his stick. And if he does make the team, part of the credit will lie in his instinctive response to a near-tragic incident last season. Credited as one of the key people who saved Redmond’s life, Peluso downplayed his role in subsequent interviews, which only further endeared him to fans. Furthermore, it cemented his reputation as a good teammate – a fact that was not lost on management. Almost every team has someone like Peluso – an easy going guy who stands up for his teammates, doesn’t take himself too seriously, and seems to get along with everyone. And often, it’s the tough guy in the room. In Boston, it’s Shawn Thornton. In Phoenix, Paul Bisonette. Georges Laraque played the role in many cities over the years. And for a time in Toronto, it was Wade Belak. Peluso may never make a big impact on the ice, but as an extra forward, who can step in and out of the lineup as needed, and keep his teammates lose, there may not be a better choice. In his heyday, Olli Jokinen was a big guy who skated well, and had a nose for the net. But last season, he looked a bit lost on the ice; he was a guy entering his mid-30’s, who was missing a step, and all too aware of it. But after being written off by pretty much everyone – myself included – I’m pleased to say that Olli looks to have turned back the clock, at least a little bit. At one point, Devin Setoguchi made a pass to his left, and a player burst through the middle of the ice in chase of it. I turned to my friend and said “who was that?” We looked at each other with blank faces, until I spotted the player going off the ice, and realized it was Jokinen. We each muttered “wow…he looks good,” but quietly, almost to ourselves, as if to temper expectations. Despite Olli’s pitiful performance last season, there are a lot of reasons to be optimistic about his play this year. Beyond the fact that he’s ashamed of how he played, he’s also in a contract year, and he won’t have anywhere to play in 2014 if he repeats last year’s folly. And if that wasn’t enough, there’s also that once-in-four-years, maybe-never-again event called the Olympics. Olli is a lock to make the Finnish squad if he plays well, but if he has another disappointing year, it would be easy to pass over a 35-year-old, run-down centre for a young stud like 18-year old Sasha Barkov. And if you don’t think that Olli knows that, then you don’t know Olli. Olli knows. Based on everything I had read about Eric O’Dell – stats, scouting reports, etc – he sounded like a lesser version of Bryan Little. And after watching him play on Tuesday against Edmonton, that’s basically the impression I came away with. O’Dell is a centre iceman who shoots right handed, has good dangles, a good shot, and likes having the puck on his stick. He’s a little bigger than Little, but also not as quick. He made a nice play in the 2nd period, taking a short pass on his forehand in the Oilers zone, quickly pulling the puck to his backhand to shield it from a defender, and lifting a high shot, which found the goalie’s glove. Even though he didn’t score, the best thing about the play wasn’t the skill it took, but the quick decision he made not to shoot the puck. Most players would have fired it without a second thought, and 9/10 shots from that spot would have gone off the defender’s leg/stick. Instead, he had the composure to make a quick move in tight, and get a good chance on goal. Barring injury, it looks like O’Dell versus Scheifele for that 2nd/3rd line centre role – a battle in which Scheifele has the inside track. But O’Dell is emerging as a nice call-up option if there’s an injury to one of the top-3 centres. Anybody heard of this hot-shot new defenceman? He goes by the name of Jacob Trouba. If you’re reading this, chances are very good that you have. Because he played in college last year, it was tough to get direct reports about him for most of the season, but by the end of the year, Jets management were raving about his size, mobility, composure, and abrasiveness on the ice. The common fan caught a glimpse of Jake at last year’s World Juniors, where he was named the top defenceman – a rare feat for an 18-year-old, given that 19-year-olds generally dominate the tournament. 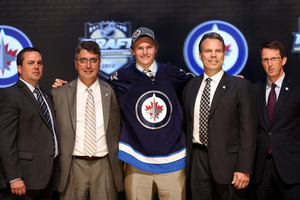 And since the day he signed a contract with the Winnipeg Jets – foregoing his last three years of college eligibility – he was anointed by many as the next great Winnipeg Jets defenceman. But many forget that Trouba is still 19 years old. He’s only been driving cars (legally) for about three years, and voting for one. He’s a teenager. And he’s being asked to play against men, who are bigger, stronger, faster, smarter, more skilled, more mature, and more experienced than anyone he’s ever played against. There’s nothing wrong with having high expectations – both from an organizational standpoint, and from the common fan’s. The problem arises when the expectations also place a best-before date. Sure, in some cases – like Drew Doughty, and Erik Karlsson – sublime talent manifests itself early, and everything clicks. (Doughty was a Norris Trophy nominee and Olympic gold medalist at 20, and a Stanley Cup Champion at age 22. Karlsson won the Norris Trophy at age 22. ) But for most defencemen, it takes a while to put it all together. The great Nicklas Lidstrom – thought by many to be one of the top-5 best defencemen ever to play the game, didn’t even start his NHL career until he was 22. And although he was very good from the start, he didn’t win the Norris Trophy until he was 30! (He ended up winning 7 in all. Seven!) The same can be said for many, if not most others, including Duncan Keith (winner at age 27), Scott Niedermayer (age 30), and Zdeno Chara (age 32). So while we might reasonably expect Trouba to play well in his early 20’s, don’t expect him to fully blossom for 5-10 years. I was impressed with Grant Clitsome. Granted, Edmonton didn’t bring their top guys, but Clitty looked very mobile out there, and he played very aggressively. He pinched a lot, but mostly at good times, and he really pressed the forward trying to leave the zone. He also likes coming into the slot with the puck to attack the net, something he started doing late last season, and led him to him finishing second among Jets defencemen in scoring. http://www.hockeydb.com/ihdb/stats/leagues/seasons/teams/0063782013.html While many Jets fans don’t think he’s capable of playing a top-4 role, I think his game is showing signs of growth. Although he’s 28, he’s only played parts of 4 years in the NHL, and only 2 as an everyday player. He seems pretty sharp off the ice, and with his skill and mobility, all he really needs to do is become more reliable in his decision making and sure-handedness to become a fixture in the Jets top-4. Carl Klingberg was a second round pick of the Thrashers in 2009. He’s always been a bigger guy who skates well, but it just doesn’t look like he has NHL-quality hands. He hasn’t put up good impressive numbers at any level of hockey, and it’s unlikely he ever becomes more than a spare part for an NHL team. He scored yesterday, off a nice pass from Eric Tangradi, but even the finish looked awkward, as he slid it – seemingly accidentally – through the five hole, when most guys would have shot for the (wide open) top half of the net. Unless he has a big year in the AHL this year, don’t expect him to earn much playing time with the Jets unless there are a lot of injuries. Devin Setoguchi continues to impress – he’s quick and skilled, and has a very good shot. Beyond just his quickness, he always seems to have a lot of jump, very similar to Bryan Little. The only on-ice concern for me is the fact that Noel wants to pair him with Evander Kane, and, worse yet – Olli Jokinen. Each of those three like carrying and shooting the puck, but none of them is a puck distributor/play-maker. Hopefully Scheifele can break up the monotony find chemistry with at least one of Kane/Setoguchi. Speaking of whom, what would a Jets update be without Mark Scheifele. Noel and Chevy must be getting sick of every reporter (and his dog) trying to find out which line Scheifele will play on this year. They jump through the hoops since they’re polite, but the question is somewhat inane, and the answer is line 2, or line 3 – not sure yet since half the guys in the middle of the lineup are new. (Literally half – Setoguchi, Frolik, and Halischuk – who is definitely in the conversation). As for his play Tuesday, he made a really nice play in the 2nd to cut around the D, and fire it just over the crossbar in almost one fluid motion. If that shot goes in, everybody’s talking about it for days. With that in mind, here are some thoughts that have been stewing in my brain since the end of last season. (1) Where should Scheifele and Trouba start the year? This is a critically important question. There is a right-way to develop players, and there is a wrong way. Teams like Detroit, Nashville, and New Jersey have been doing it right for years, and have consistently developed young players, without the benefit of draft lottery picks. In stark contrast, teams like Florida, Columbus, and New York (Islanders) are textbook examples of how to screw up good young talent. Maybe Mark Scheifele (age 20), and Jacob Trouba (19), are ready to play in the NHL today. They’re certainly both great prospects with promising futures. But what happens if they’re not ready yet – can Jets management resist the temptation to “give them a look”? There is a long, sordid tale to be told of the young players whose fruit was reaped before it ripened; players whose NHL careers began before they were battle-tested in the American Hockey League. 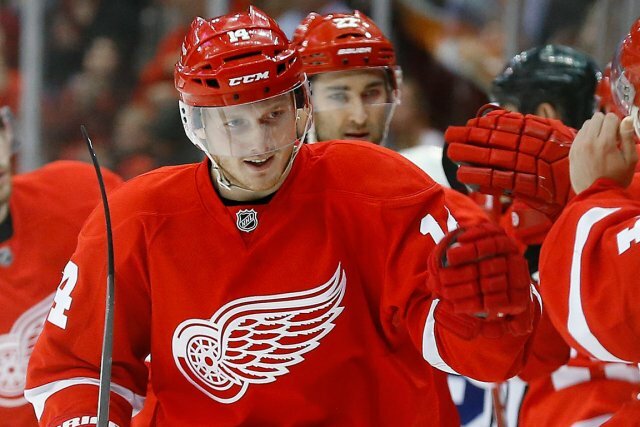 Here are just a few recent examples – none of their names will be familiar to casual hockey fans, but they were all good enough to make the NHL as teenagers: James Sheppard, Gilbert Brule, Colton Gillies, Oscar Moller, Rostislav Olesz, Nikita Filatov, Nino Niederreiter. Most of them suffered through pitiful rookie years, during which time they could have been playing at lower levels, and adding speed, strength, maturity, and most importantly, confidence. Every one of them has been traded from their original organization – a clear acknowledgement that things never worked out as planned. While those are just the most abject failures, Luke Schenn, Mikklel Boedker, Brett Connolly, and Ryan Johansen are further examples of teenagers who were pushed too soon, and are mere shadows of their draft-day billing. On the other side of the coin, there’s a surprising list of current stars who played abbreviated seasons in the AHL before coming to the show. I don’t think the careers of Corey Perry, Ryan Getzlaf, Claude Giroux, Jason Spezza, Thomas Vanek, James Neal, Logan Couture, or Zach Parise were harmed by playing in the AHL. And the same can be said for P.K Subban, Kris Letang, Nik Kronwall, Duncan Keith, Mike Green, Shea Weber, and Zdeno Chara. Perhaps playing in a developmental league where they got more ice time, and played under less pressure, even helped them. Who knows. Now that’s not to say that a young player can’t jump straight from junior/college hockey and be successful, but the vast majority of players who have made that leap are top draft picks – 1st, 2nd, or 3rd overall – players like Crosby, Stamkos, Toews, Malkin, Tavares, Kane, etc. Once you get past pick-5, it’s rare for a rookie to step right into the NHL without some AHL seasoning. (2) Who are the best lesser-known Jets prospects? Every Jets fan has heard about Mark Scheifele and Jacob Trouba ad nauseum, and probably knows a bit about Josh Morrissey. They’re all 1st round picks, and they get most of the attention. But there are three other players who could figure prominently into the Jets future. Nic Petan is a pint-sized centre from Delta, B.,C drafted in the 2nd round this past year. If he was even 6’, 180 lbs, he would have been taken in the top-5 picks, but since he’s ~5’8, 160, he fell to the Jets at #43. He has great hands and quickness, but what really sets him apart is his ability to see the ice and read the play. He’s one of those rare guys who has the composure to cradle a rebound in front of the net, and instead of flailing wildly at the puck, he’ll spot a teammate back-door for a tap-in. If David Desharnais (Mtl) can play in the NHL at 5’6, I see no reason why Petan can’t play at 5’8. Granted he won’t play anytime soon, but after 2 more years in junior hockey, and a year and a half in the AHL, he could be ready to give the Jets’ powerplay a shot in the arm. Look for him to make the Canadian World Junior team this winter. Initially, Adam Lowry was known as the son of former NHLer Dave Lowry, who played over 1000 games in the NHL, most memorably with Florida in their 1996 Stanley Cup run. But that was before his stellar 2012-2013 season, which saw him win the Four Broncos Award for WHL Player of the Year. Although he was 32 points behind fellow Jets prospect Nic Petan for the league lead in scoring, he did basically everything for the Swift Current Broncos, scoring 45 goals and 88 points, while no other teammate had more than 24 goals, or 59 points. Not only does he have some skill, but he’s also 6’5, and by all accounts, he’s been using thus far in Jets training camp. Like most 20-year-olds who stand 6’5, he’s still growing into his body, but if he can strengthen his legs and improve his skating, he could be a huge part of this team in a few years. I’ll be very curious to see how he does in St. John’s, and whether the offensive numbers he posted in junior will carry over to pro hockey. For a guy who isn’t terribly big or fast, Scott Kosmachuk is making a lot of noise at training camp. He has good hands and a very good shot, and reminds me a bit of Michael Ryder – another guy who doesn’t really stand out, until he gets the puck in the slot, and it suddenly finds the back of the net. He scored a quick rap-around goal against Washington in the exhibition opener on the 14th, and seems to be one of those players that comes alive once the puck is on his stick. He’s scored over 30 goals in each of the last two OHL seasons, and looks to build on that production heading into his last year of junior hockey. It’s hard to say at this point whether Kosmachuk will ever make an impact in the NHL, but the Jets will be eagerly monitoring his development. (3) Are there any darkhorses who could make the team? Yes – meet Eric O’Dell. Often overlooked because of average size and speed, it’s hard to ignore his skill. Though he’s not as quick, he plays a bit like current Jets centre Bryan Little – smart, with decent playmaking ability and a very good shot. He had an operation in 2010 to repair a strange birth defect – a hole in his heart, which had grown to be as big as a quarter by the time he turned 20. Although he didn’t play hockey for 6 months following surgery, the operation allowed him to increase his fitness level, since the hole was decreasing the flow of blood between the chambers of his heart, leaving him to operate around 80% capacity beforehand. Since turning pro, he’s taken his conditioning to a new level, and it really showed this past year, as he was easily the Ice Caps best player, scoring 29 goals in 59 games, in a year where no one else managed more than 15. With Little, Jokinen, and Slater penciled in at centre, O’Dell is competing with Mark Scheifele for that last spot. And while that spot will likely go to the youngster, there’s a good chance we’ll see O’Dell join the big club if and when there’s an injury. (4) Who were the best off-season additions? I think it’s pretty clear that the best player added this off-season was Devin Setoguchi. He’s a steady 20-25 goal scorer, who pencils in nicely on the second line. Enough said. 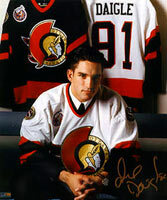 But the best move, in my opinion, was signing Matt Halishchuk. And it’s all about value. Devin Setoguchi makes $3M, has only 1 year left on his contract, and was traded for a 2nd round pick in next year’s draft. If the Jets had made a similar move last year, we wouldn’t have drafted Nic Petan, and amateur GM’s everywhere would be talking about how smart some other team was to get such a talent in the middle of the 2nd round. The problem is, if Setoguchi plays well this year, he demands a raise – probably north of $4M per season, and the Jets may not be inclined to give that much money to a second liner. If he plays poorly, then it was foolish to give up a second rounder in the first place. If he has a decent year, and likes the city, maybe we keep him at a reasonable salary, but I think it’s more likely that he walks at year-end, meaning we gave up a decent asset for essentially a rental player. By contrast, Matt Halischuk flew under the radar this off-season after being let go by Nashville. He signed a ‘two-way’ contract with the Jets, which pays him $650,000 if he makes the team, and only $250,000 if he plays in the AHL. Though he’s not as skilled as Setoguchi, he did score 15 goals two years ago in Nashville, despite playing in a role which gave him little or no powerplay time. He may not be big or fast, but he’s a coach’s dream because he works hard and plays a very smart game. I fully expect him to make the team, and be a go-to guy on the penalty kill, though he may also provide some offence based on smart positioning and a willingness to go to the dirty areas. That’s exactly how he scored the game-winning goal for Canada at the 2008 World Junior Championships – slyly shoveling home a Shawn Matthias rebound to beat Sweden in overtime. Michael Frolik was also an interesting addition. He was acquired from Chicago in exchange for 3rd and 5th round picks in this year’s draft – a small sacrifice, considering the Jets still made 10 picks. Though he’s played in the NHL since 2008, at 25 years of age, he’s still a young player. He was highly touted as a teenager, playing pro hockey in the Czech Republic at age 16, which had some people referring to him as him as ‘baby Jagr’. He scored 20 goals in each of his first two seasons in Florida, but was then traded to Chicago, where he took on a lesser role because of their offensive depth. He should play a bigger role in Winnipeg, especially on the powerplay, and hopefully the results will follow. The only other addition was Adam Pardy – a big depth defenceman who probably won’t play very much unless/until injuries occur. (5) What are the best forward line combos? Ladd, Little, and Wheeler should and will stay together. Enough said. As for the second line, Scheifele gets the nod between Kane and Setoguchi mainly because Jokinen proved last year that he can’t play with Kane. Olli has never been accused of being a good playmaker, hence why he rarely played with Jarome Iginla in Calgary. It’s a lot of pressure to put on a rookie, but there really is no one else, unless O’Dell has a very impressive camp. Although Frolik prefers to play right wing, I expect Matt Halischuk will force his way up the lineup and slide in on the 3rd line. Wright and Slater are a nice tandem on the 4th line, and you can fill in whoever you want in that last slot. Halischuk will probably see time on either of the bottom two lines, and the same could be said for Wright and Tangradi. Although Noel has been loathe to split up Buff and Toby, I think an Enstrom-Bogosian pairing works much better. It allows Enstrom to play more offensively, and not worry about having to clean up after Buff. (Enstrom and Buff would be re-united on the powerplay). It also gives Bogosian more of a chance to develop offensively by playing with a gifted player like Enstrom. Moving Buff down with Clitsome allows them both to play easier minutes, and still gives Buff a good skating d-man to pair with and help cover his tracks. Assuming Trouba makes the team, he will likely pair with Stuart on the bottom pairing, as it gives him a veteran to play with in relatively low-pressure situations. If Trouba doesn’t make the team, then Redmond probably leapfrogs Pardy and Postma and takes the last spot. (The only reason he isn’t on the team to begin with is because he can play in the AHL without having to clear waivers. Postma would have to clear waivers). (7) Which Jets will be at the Olympics? Pavelec is a lock to be one of the Czech goalies, and Jokinen will almost certainly be on the Finnish team, which speaks to their depth up front. Blake Wheeler has a good chance to make the US team, but he may run into trouble because there are more talented wingers available – Kane, Kessel, Ryan, Parise, etc – and though he may be more gifted than some of the other contenders, US team management may decide that they don’t want an offensive guy in a 4th line role. Byfuglien could very well make the US team as a 7th d-man, as his shot would come in very handy on the powerplay. Bogosian could also make a push if he starts the season well, but there are currently better options available. As for Andrew Ladd, it’s amazing that he even got the camp invite, considering the bevy of options Steve Yzerman has for Team Canada. At this point he’s a longshot, but an injury to the right guy – one who was slotted to play LW on the 4th line – could make all the difference. As for other key Jets, it was odd that Tobias Enstrom didn’t even merit an invite to Sweden’s summer camp. Less so with Evander Kane, as Taylor Hall is already in tough to make Team Canada, and he plays a similar game. Jacob Trouba was actually invited to the US summer camp, but they invited several young players in preparation for future international events. Michael Frolik has an outside chance to make the Czech team, but he would need to have a very strong start. (8) Will the Jets make the playoffs? When the Jets first moved to the new 7-team division, which includes Chicago, St. Louis, Minnesota, Colorado, Dallas, and Nashville, I would have said no without a second thought. But after free agency concluded, and the dust settled, I took another look. Keep in mind that, apart from Chicago and St. Louis, the only other team that made the playoffs last year was Minnesota, and they just squeaked into 8th spot, edging Columbus based only on wins. Minnesota hardly improved this off-season; in fact, they lost 4 of their top-9 forwards due to salary cap constraints. Meanwhile, Dallas went through an overhaul, adding a few aging veterans like Gonchar, Horcoff, and Peverley, and more importantly, the wild-child himself, Tyler Seguin, in a blockbuster trade with Boston. Nashville behaved oddly, handing out inflated contracts to marginal forwards, while leaving defensive spots open for untested rookies. Out of the bubble teams, Colorado was the only team, (Jets aside), who clearly improved, adding Tanguay from Calgary, Steve Downie (missed all of last year with a shoulder injury), and Nate MacKinnon with the first overall pick in the draft. While the top-two spots should be claimed easily by St. Louis and Chicago, the other two spots could literally go to any of those other five teams. Some people like Dallas because of all the noise they made in the off-season, but it’s hard to imagine they’ll come out of the gates quickly after all that turnover. They’re also one Kari Lehtonen injury away from a low finish, and he’s had a number of injuries in his career. Minnesota is counting on a trio of very young players to fill out key forward positions, and typically that isn’t a winning strategy. Their defense is also shaky, to put it kindly. Nashville is always a tough team to beat because of their goaltending and tight defensive system, but seriously, could they have less offensive talent? I think even Calgary has more skill in their putrid lineup. If anything happened to Rinne or Weber, they’d be in huge trouble. And while I mentioned that Colorado has improved, we’re still talking about a team which finished last year in 2nd last – the forwards may be improved, but they have the same brutal defence, and a very average goaltending tandem. And then there’s the Jets. Although they’ve never been great defensively, they do have a wealth of talent back there between the established guys – Enstrom, Byfuglien, Bogosian, and the kids – Trouba, Redmond, and Postma. Sure, they don’t have a great shut-down defenceman, but Bogosian is getting there, and Buff looks poised for a good year based on his improved fitness. Up front, they aren’t going to carve you up, but their scoring depth is significantly better than either of the past two years, as Setoguchi, Frolik, and Halischuk all have something to contribute. Olli Jokinen will be better this year too – though mainly because he set the bar so low last year that he can’t possibly be worse. Ultimately it will come down to Ondrej Pavelec – and perhaps Al Montoya, if Noel lets him play more than 6 games this year. There aren’t a ton of responsible defensive players in this lineup, so Pavelec will have a lot of tough nights, but if he can be steady and reliable, they have a good chance. The problem is that Pavelec play is of the boom-or-bust variety to this point, which makes it harder for the team to sustain a long winning streak. My honest answer to the question is, I don’t know. I’ve seen worse teams make the playoffs, and better teams miss out. If their key players stay healthy – Ladd, Little, Wheeler, Kane; Enstrom, Buff, Bogo – and Pavelec is even marginally better than the past two years, then I think the Jets will get in. But if Pavelec is bad, or hurt, or if we lose more than 1 of those key guys, I think it’ll be very tough. Now, with all that being said, don’t forget that there is no guarantee that the 4th place team actually makes the playoffs. Although there may be four spots up for grabs in each newly created division, there is a cross-over in effect, meaning that a Western Conference team in the other division can take the spot of a team in our division. So let’s say that St. Louis, Chicago, and Minnesota finish 1-2-3 in our division, while LA, San Jose, Vancouver, Anaheim, and Edmonton finish top-5 in the other division. The Jets could finish 4th in the division, but if 5th place Edmonton finishes with more points, they make the playoffs, and we hit the links. That’s it for now. Coming up, I’ll be doing a fantasy hockey preview.